I’d bet we have all heard the term “truck gun” before, possibly in online forums or magazines, and I’ve read quite a few different definitions of what it means… so here’s mine. A truck gun is any gun that you don’t have much attachment to or expectations for, beyond it working every time you pull the trigger. Appearances don’t matter; all that matters is that it fits in your truck and fires even if stowed in dusty glove-box or bouncing around the dirt and debris in the floor of your cab. Because of this caveat, I always put the truck gun one step below a beater gun because I have seen some rather attractive guns listed as beaters, but truck guns are usually downright hideous looking. And that’s just fine, because you should have no problem finding something ugly that fits in your car for under $200. 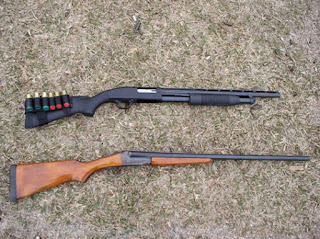 Ugly is in the eye of the beholder, but one of the ugliest guns I have ever seen has to be the old bolt-action shotgunsproduced by Mossberg. If you’ve shot shotguns for any stretch of time, you’ve definitely seen these things, usually a box magazine contraption with a Polychoke at the end of the barrel that looks more like a musical instrument than something lethal. The good news though is that they are usually very reliable and very cheap. I cannot recall seeing one over one $150 dollars in a very long time. The last one I owned was only a couple of years ago in 16-gauge and I paid around a $120 dollars for it and then had the barrel cut down to 20 inches. Post clean-up, I had no more than $200 in it altogether. Most gun shops would be delighted for someone, anyone to buy one of theirs and you can probably get a good deal on one. They can be found in 12, 16 and 20-gauge and make a great gun for a vehicle. If handguns are more your thing (and in many minds, they lend themselves much better to the definition of truck gun) there are certainly enough of those out there for less than two big bills waiting to be bought up. My nephew picked up one such example not that long ago that would be perfect to just toss in a vehicle. His choice while not the most aesthetically pleasing in this purists eyes, certainly is functional—the Nagant M1895 revolver, a reliable revolver that many Guns.com readers thought should have ended up in our most unusual handguns article. The Nagant M1895 revolver is a seven shot wheel gun in 7.62 mm Nagant. It saw service with the Russian and the Soviet military during two world wars and there were nearly two million of them produced. With power about the level of the .32 ACP it is not a bad gun to have around if one can get past the very tough double action trigger. You will see the guns online for sale often for less than one hundred and fifty dollars, and where can you get a cartridge revolver for that price? For those looking for a decent little .22 revolver, one can still find a good deal with some of the old H & R’s like the Model 922, 686, and the 929. These little .22 revolvers don’t have the glamour or glitz of a Ruger or Smith & Wesson but they work and are usually found for well under two hundred dollars and that is with the tax. One of these guns and a brick of .22 Long Rifle can go a long way without breaking the bank while the skills gained while shooting it could be priceless. Also, depending on its intended function inside your truck, it could be considered an appropriate defense caliber given the close distances it would be fired at inside the cab of your car. It also won’t blow your eardrums out if you do end of having to fire it inside your vehicle (though it won’t be quiet either). If you are looking for a little .22 rifle to carry around that is as reliable as taxes in April than look no further then the little Marlin Model 60. This little semi-auto rifle has been made the same way for decades and in its basic form costs less than two hundred dollars. If you are asking me, you will get every dollar worth out of that little gun, but it is almost too pretty to want to carry around in a truck new so look for a used one. I’m sure others will find more guns that fit their idea of something to haul around in a truck and many of them will be under two hundred dollars, but these are ones that are easy to find and you probably won’t care how they look after a few months of being bounced around in your car. The truck gun is like any other tool that has dings and scratches but gets the job done. These are just a few I would not be afraid to put another ding or dent in. Stretch your budget just a tad and you can buy a Ruger 10/22...not ugly but certainly as reliable an autoloader .22 as is made. There's a new takedown model that will store easily and be low profile until needed. The 10/22 Ruger should definitely have made this list .. I've seen them advertised around upstate NY used for less than a couple hundred bucks and they can be tricked-out pretty nicely as well.